This past Sunday, I made $150 (American) for 90 minutes of talking. Between 2:00 and 3:30 p.m. two extremely articulate and charming women from a New York City-based market-research firm interviewed me on location in a hardware store in Toronto. The topic? What goes through a guy's head when he's in a hardware store with his spouse trying to make decisions about a kitchen-renovation project. B: While I won’t go into every boring detail, I’ve decided to share a few highlights. After all, the process was as much marriage counselling as it was consumer marketing. CHANNELLING ARCHIE: I can't believe I faked it. She paused, glanced my way, as if to send me my cue, I opened my mouth to sing and I FORGOT THE WORDS. The next line is so stinking obvious--“Guys like us we had it made”--that our developmentally delayed cat Kiwi could have guessed it but not me. I sat there, mouth open, as if I’d gone into shock and then—I can’t believe I did this—I faked it! What psychosexual Darwinian impulse in my excuse for a brain made me want to cover the fact that I don’t know a 45-year-old TV theme-song lyric? GEOGRAPHY TEST: Could be south Corian; could be north. was a very new English speaker and no he was not Corian. 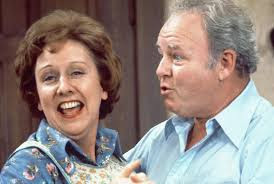 2) Early on in the interviewing process,the very charming and--okay okay--attractive researcher named Malinda--the one who know all the words to the All in The Family song--asked if her equally delightful colleague Ali could video the process. It would save her taking notes, she said. Then about 50 minutes in, Malinda looked me in the eye and asked a very personal question about our shopping habits. But first, she reassured me that "nobody, not Helena, not Jimmy, will ever get to see this." Helena is of course my wife. Jimmy is our go-to contractor. I'd mentioned both of them quite a few times up to that point in the interview. So I fessed up. "Malinda? Once in a while I get the distinct feeling that if we're in a hardware store and Helena gets advice from a clerk, she'll be far more receptive if he happens to be good looking and sincere. He doesn't have to be Barbie & Ken handsome," I said, but if he's a good listener and has "nice eyes," he's going to have an easier time convincing her. Frankly, I told Malinda, who was a pretty fair listener herself, "it drives me nuts." I added that a mild accent is actually a plus. I hadn't noticed until that moment that my new New York friend to whom I'd just spilled my guts had herself a barely detectable NYC twang. 4) I also told her I think a certain Canadian chain store known for its tires and red-shirted clerks should launch its own line of perfume because Canadians really like the way that store smells. Malinda politely disagreed. 5) Some jokes are better said than read. When we were looking at wood finishings, I mentioned something about Mennonite furniture. I asked if they knew about Mennonites, and Malinda responded with, "I'm a Mennonite." Which of course meant off fell the one kind of filter they didn't sell in that hardware store. I looked at Ali and asked "What do you call a guy with a five-o'clock shadow who lives really close to the Pennsylvania border? Ahm-ish." I can't believe they have this on film. 6) Or this. Early on and while the video was rolling, Malinda asked how home-decor decisions were arrived at in our house. After a roundabout discussion, I suddenly thought of and blurted out a line I'd heard a standup comic use recently: "Somebody should open up a restaurant called 'You Decide.' It'd be a hit, especially with couples who've been married a long time." 7) I bet next time, they're going to ask Helena.